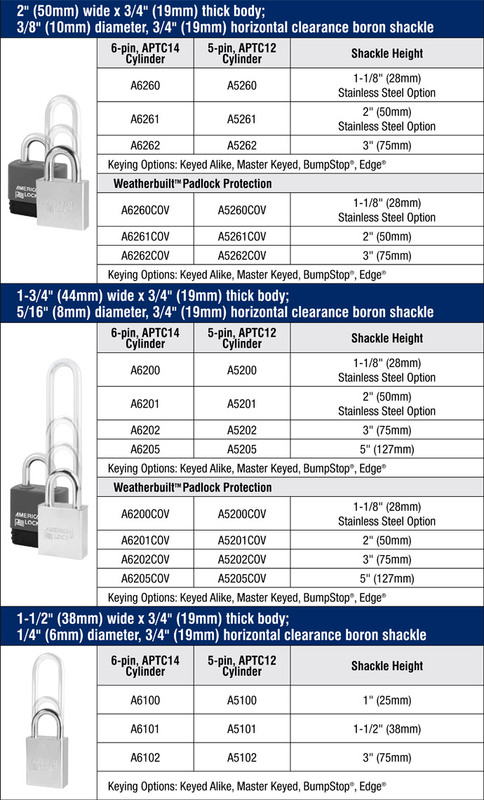 American Lock rectangular padlocks offer strong security, with hardened, chrome plated solid steel bodies that resist cutting, sawing and corrosion, and hardened boron alloy steel shackles for superior cut resistance. These solid steel padlocks are rekeyable, with replaceable cylinder and shackle, making them easy to service. Applications include securing gates, sheds, truck and van doors, industrial machinery and construction equipment. Weatherbuilt™ Padlock Protection is available for the 2" and 1-3/4" model, with the added optional upgrade of stainless steel shackles for the best combination of corrosion- and cut-resistance. Enhanced keying option includes BumpStop® Advanced Cylinder Technology and Edge® Key Control. Includes A5260, A5261, A5262, A6260, A6261 and A6262, with specifications listed below. Includes A5200, A5201, A5202, A5205, A6200, A6201, A6202 and A6205, with specifications listed below. Includes A5100, A5101, A5102, A6100, A6101 and A6102, with specifications listed below.